Grades 9-12 are eligible to participate in both the local and state contests. Only students in grades 11-12 are eligible to advance to the National Level, per NRLC guidelines. 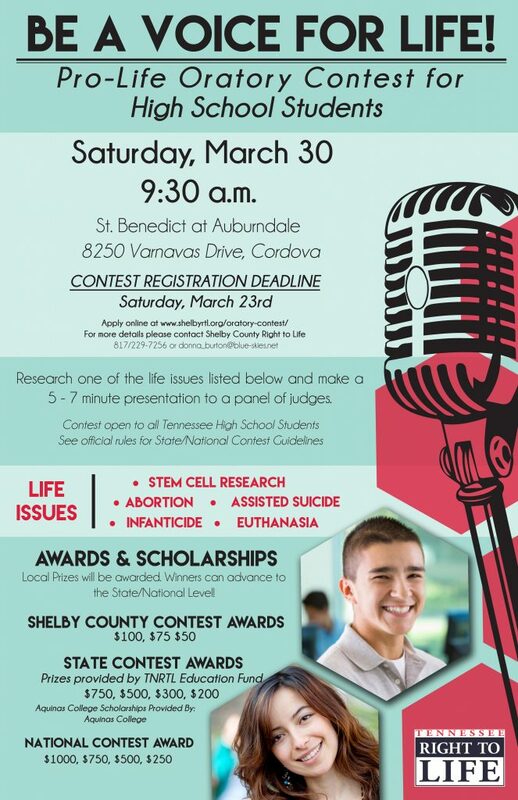 Contestants are to research, write and present an original pro-life speech on abortion, infanticide, euthanasia, or stem cell research. Props should not be used in the presentation. Speeches are to be 5-7 minutes in length. Disqualification will occur if the speech is under 4 or over 8 minutes at the state and national level of contest. When statistics are used it should be the most current information available. Speeches are required to be memorized for both the State and National levels.